The interior is decorated with different furniture, paintings, closets, indoor plants as it creates a beautiful atmosphere.Here are some traditional designs of lounges in a house which looks classic with their furniture and display items. A Lounge is a sitting room where we place television for entertainment and get relaxed in couches. But, in hotels, theatre, it is a place where the people get relaxed or wait in seating arrangement. In the view of this image you can see a traditional design of lounge. The lounge looks classic with the furniture. The sofas are antique and of victorian style with grey pillows. There is a chaise to get relaxed and a centre table which is decorated with flower pots. The false ceiling is has a design and a massive hanging chandelier. It has closets with drinks and special chairs to have the usual drinks. You can place a television unit instead of closets. There are bilberry pendant lamps on the tables and frames are also decorated on the table. The flooring is made with the tiles and a loop pile patterned carpet. The walls of the interior have many shelves with books and a mirror which reflects the beauty of lounge. This image is a traditional style of a lounge. The interior is decorated with soft beige color and the wall has television and a fire-pit for making the room warm. The wall has candescent lights and ceiling is also simple with lights. The flooring is hardwood flooring made with santos mahogany and a berber carpet is laid on it. The couches are cariole couches with pillows and the interior has a centre table, settee. The room has glass windows and can view outdoor garden. The lounge can be even decorated with paintings and indoors plants which gives a pleasant environment. Here the image is a traditional design of lounge. The sofa is a english roll arm with a designed pillows with a centre table and has flower pots on it. The flooring is hardwood flooring made of oak tree and has designed carpet. The wall is decorated with paintings and have shelves with the books and display things. The windows are casement windows where we can have outer look. Prefer this types of designs if you have small space and if you are classic type then you definitely like these lounge designs. These type of couches are comfortable to seat oneself and get relief. 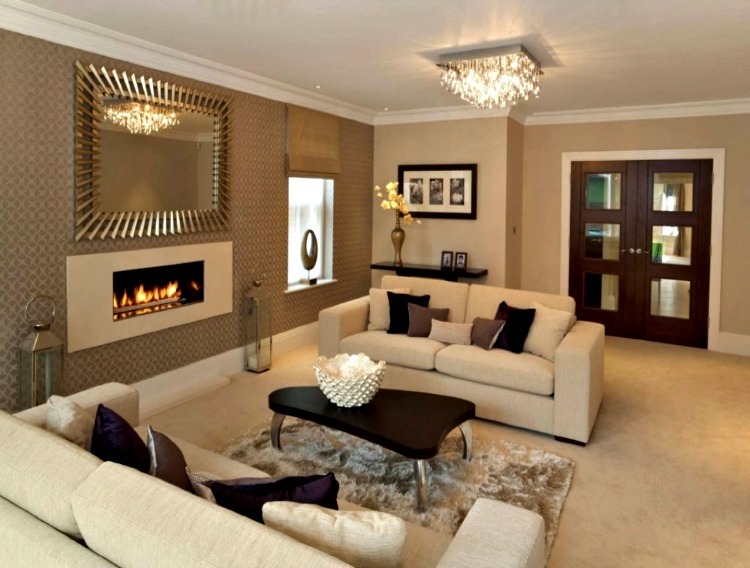 In this view of image you can see a traditional look of a lounge where the interior is elegant. The room has chesterfield sofa and settee of earthy beige color. The flooring is made with white ceramic tiles which gives a cozy feel when we walk. The false ceiling has a design with pendant lights and chandelier. The wall is decorated with sconces and has picture windows decorated with sheer curtains that are delicate and hanging curtains. There are lamps on the tables for lighting and the centre table is decorated with idols, lamps and books. In the view of this image you can see a traditional lounge. The interior has furniture and decorated with light chocolate color with contrasting dark chocolate color. It has modern couches with dark pillows and looks amazing with a center table which is modern and has a decorative pottery. The flooring is plain vinyl flooring and has smooth surface and the false ceiling is plain with a massive chandelier attached to it. The wall is decorated with a wall paper and has a mirror with a fireplace under it for providing a warm temperature. The lounge is simple but looks impressive with its color. In the view of this image you can see a traditional lounge that acts as both an entertainment and primary living space. It is a classic room for sitting and having casual drinks. The flooring is made with wood and has a antique designed carpet. The sofas are chesterfield sofas and are elegant. The walls are decorated with painting and has a closet which has an alarm clock and accessories. The coffee table can be decorated with flower pots or decorative items. The room has indoor ornamental plants which gives a fresh look to the room. The windows are picture windows which can be decorated with draperies or curtains. When we have a look on this image you get amazed with the sophisticated settings for hosting and entertainment. Many people can assemble in this lounge to have conversation together without distractions like television. It is designed with utmost quality and looks modish and make people feel to have this type of lounge. There is eye catching saturated color modern couches and looks phenomenal. The interior is decorated with a ceiling on the wall and is loyal. The interior design has a great effect on the lounge. The false ceiling is extraordinary with ceiling lights. The centre tables are decorated with candles. If you are looking for a elegant and modish lounge with palette of earthy colors you can prefer this design. The sofas are ultra modern with the contrasting color pillows to compensate the lack of brightness. The mod loft coffee table is decorated with slam pottery and can be used for reading or to have some snacks or casual drinks. The wall is decorated with a wall painting theme of abstract painting of a man. The windows are picture windows to have a exterior view and are decorated with the sheer curtains which are delicate. The flooring is made with wood and has laid a textured carpet. In the view of the image you can see the rustic traditional style of lounge design. The entire interior is made with stone and has rustic wood frame picture windows.The room has plenty of cabinets and shelves to place books and accessories in it. The sofas are hazelnut burgundy sofas which are very comfortable for seating and has a striado coffee table which is decorated with snacks or casual drinks. The flooring is dash walnut hardwood floor with a tuftex smooth carpet. The interior looks so bright and the false ceiling is also decorated with wood. The closets are decorated with antique things and toys. This image of lounge has a traditional interior and looks cozy. The interior has plenty of closets decorated with ceramic plates, bowls, toys and books and has a fireplace as it creates a warm weather and beautifies the room. It has english roll arm sofas with a elegant look and has claire coffee table made with the glass. The flooring is made with wood and has a patterned carpet on it. There are glass windows which has pelmet curtains to have a beautiful outdoor view. The false ceiling is made with wooden base and simple ceiling lights with a chandelier.